Car-Tel Communications: Introducing the NEW HTC FUZE!! Introducing the NEW HTC FUZE!! Go the next level with the HTC FUZE(TM) now featuring a sleek new touch screen design. The multi-faceted HTC FUZE(TM) is a 3G Windows Mobile® smartphone brought to you by AT&T, allowing you access to the world and a host of world class features. This powerful smartphone fuses technology with style. The large 2.8 inch VGA touch screen includes HTC's one touch TouchFlo(TM) 3D user interface for quick access to your favorite features. The FUZE is capable of supporting up to 32 GB in expandable MicroSD memory, so storing music, video, pictures, and any other file is no problem! 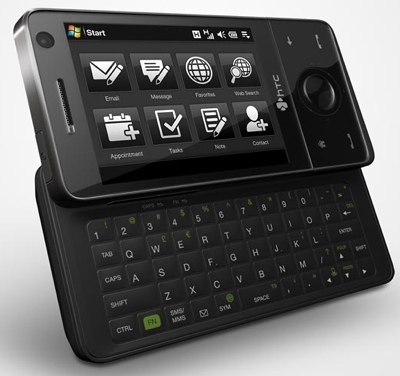 This powerful smartphone is equipped with a productivity software suite, including Windows Mobile 6.1 Professional and Microsoft Office Word Mobile, Excel Mobile, PowerPoint Mobile, and OneNote Mobile. Wi-Fi, E-mail, Bluetooth®, and GPS navigation add to the rich feature set making the HTC FUZE(TM) the ultimate mobile smartphone. Visit, call, or e-mail your local Car-Tel representative and ask how the HTC FUZE(TM) can meet your needs.